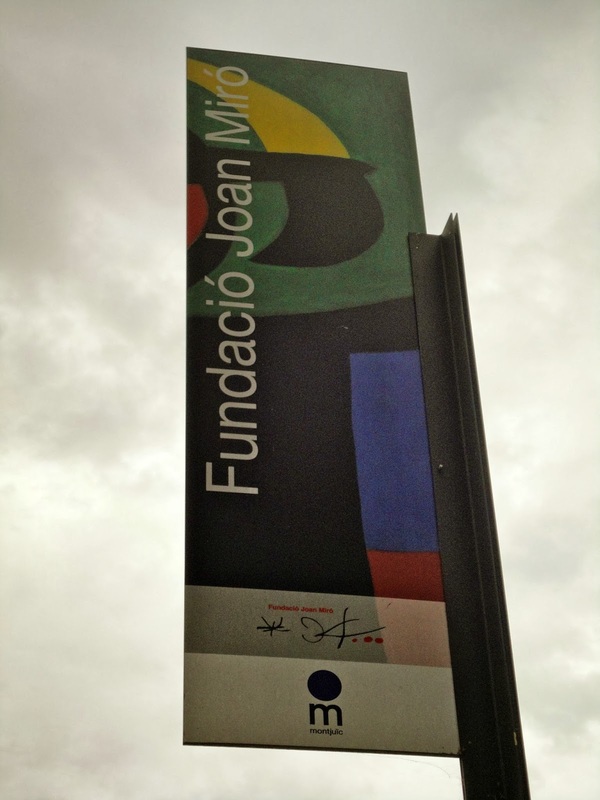 I decided to focus on Joan Miró because I visited the Fundació Joan Miró, a museum dedicated to his work, when I studied abroad during the fall of 2012. This museum is located on top of a mountain, and is a bit of a hike to reach. However, when you arrive at the top you have a beautiful view of the city. Before I visited the museum, I didn't know much about Miró other than what I had learned in my Spanish classes in elementary school. In viewing his works, I had a sense that I had seen them before. His works are very memorable and bold, and will likely seem familiar to many. I have included a number of photographs that I took at the museum. 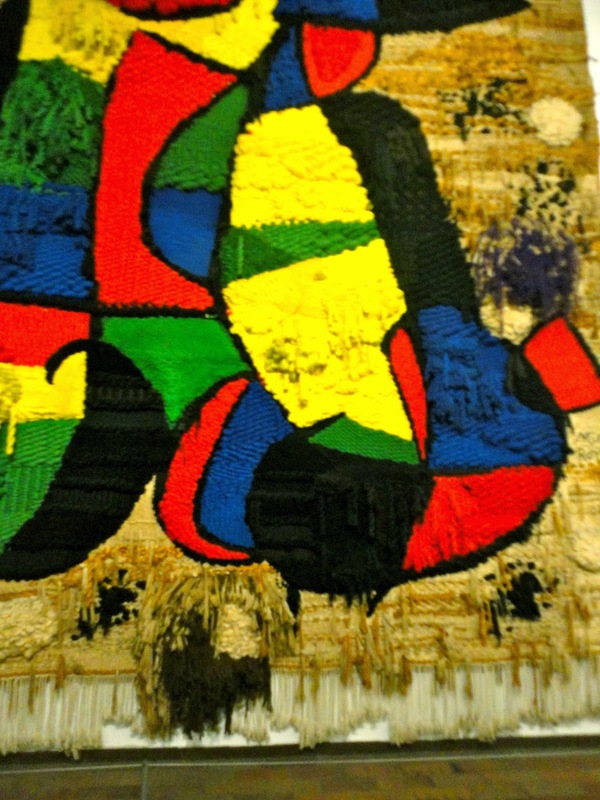 On the left is a tapestry created by Miró. On the right is a view of the basement floor of the museum. Below is a shot of Barcelona taken from the roof of the museum. Joan Miró was born in 1893 in Barcelona. His early work was influenced by cubism, Fauvism, and the artists Vincent van Gogh and Paul Cezanne. The time period considered to encompass his early works extended to around 1922. During this time Miró's work was often of landscapes in Montroig, where his family's farm was located. The Farm is considered to be one of his best works from this time period. The Farm 1921-22 is a very detailed painting, rich in descriptive information. Hazan writes that in this painting, Miró was able to paradoxically capture both a representation of a farm, and the process of representation itself. Though Miró's most commonly used medium was oil paint, I located some drawings that he did at a young age, which seem to have foreshadowed his whimsical style. According to Malet, these were Miró's earliest drawings, completed before he entered the Exchange School of Fine Arts. It can be deduced that they were drawn prior to 1907. Miró returned to Paris in 1923, and it was around this time that Surrealism began, a sort of combination of reality and a dream state. 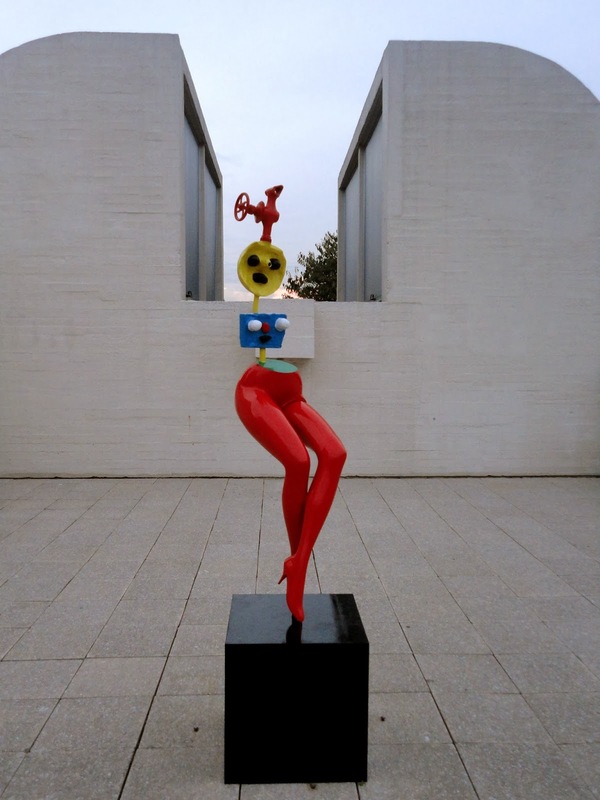 Miró's work began to reflect both this movement and the Dada movement, which sought to "put an end to all sorts of preconceived ideas and invent new systems of expression" (Malet). This makes more sense when we examine a work from early on in this era. Catalan Landscape (The Hunter) 1923-24 shows an abandonment of realistic depiction. 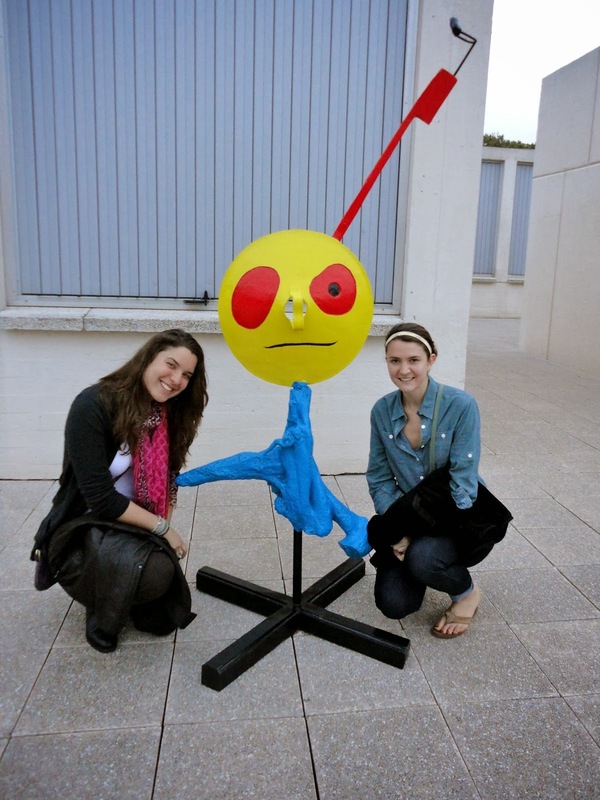 Each object is highly stylized, with Miró changing a natural object into an imaginative one. Objects are reduced to a few defining, or not so defining, characteristics. The turning point in Miró's career was in 1940, when he painted a small series on paper called the Constellations, which were "inspired by contemplation of the starry sky over the Normandy coast" (Faerna). The way that these painting cover and extend to the edges of each sheet of paper create the feeling that the paintings are continuous and can be joined. An example of this follows. The final years of Miró's career involved the use of a lot of black, and a looser application of paint to the canvas. These are perhaps his most recognizable and memorable paintings, due to their bold simplicity. 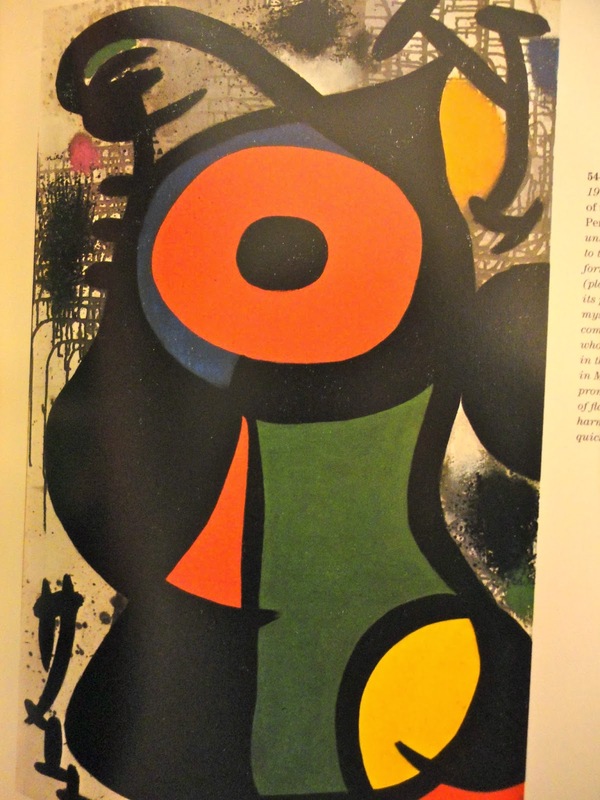 Malet writes that "Miró did not change his language but gradually refined and reduced it to the purely essential, without ever abandoning the themes that had always been his main concern: the earth, the sky and the heavenly bodies, women, birds..." (Malet). Though Miró's work clearly evolved throughout his lifetime, his entire body of work is memorable because of its bold colors. To me, his work seems to slowly evolve into highly simplified representations of things that had always been his favorite subjects. Faerna, Jose Maria. Miró. Trans. Elsa Haas. New York: Harry N. Abrams Incorporated, 1995. Print. Hazan, Fernand. Miró. Trans. John Greaves. New York: Portland House, 1989. Print. Malet, Rosa Maria. Joan Miró. Trans. Kenneth Lyons. New York: Rizzoli International Publications Incorporated, 1984. Print.